The area around Terrace is full of adventure and opportunity! There’s nothing that makes one feel alive like getting outdoors on a motorcycle, ATV, or snowmobile. 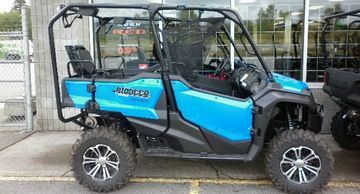 Neid Enterprises is the go-to place in Terrace for all your recreational needs, including parts, accessories, and service to make sure you’re all set up to set out. We carry full lines of some of the biggest brand names including Honda, Kawasaki, Arctic Cat, and more. Come down to our dealership or just give us a call or use the efrom provided on the page to send us an email. We are looking forward to hearing from you. At Neid Enterprises, we are outdoor enthusiasts and we want to help you enjoy yourself more than ever. We offer financing options to help give you the opportunity to get into the great outdoors and have a good time. We also offer in-house financing options for Honda products.